According to the Russian Ministry for Emergencies (EMERCOM), the areas at risk of avalanches exceed 3 million km², which account for about 18% of the Russian territory. The need to live alongside this threat entails that risk mitigation measures should be taken to protect ski resorts, residential areas, roads and railway lines located in these areas. 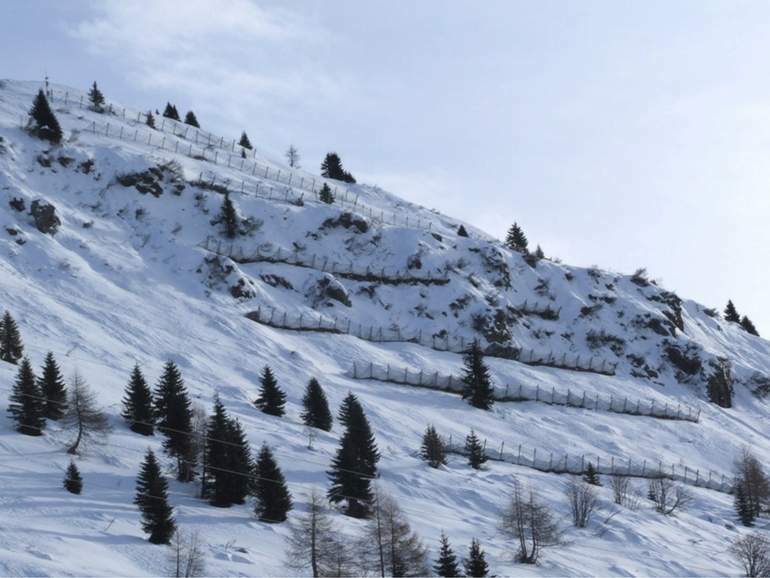 Our snow fences considerably reduce the risk of avalanches and can offer a solution to this problem. We designed these special mesh barriers to stabilize the layer of snow on the slope and retain it throughout the season. Barriers are installed only in the potential avalanche initiation zone, thereby preventing triggering of the avalanche. The retaining nets absorb the force exerted by the snow-pack and transmit it to the ground by means of a system of snow fences and anchors. The flexibility of our snow fence system also allows to retain dynamic loads, such as falling rocks and ice blocks. Our engineers designed these flexible snow fence systems 15 years ago through full-scale tests in the Alps. Our solutions have been approved by the Swiss Federal Institute for Snow and Avalanche Research (SFISAR) in Davos, Switzerland. Since 2014, we produce our snow fence systems also at our Russian plant in Kurgan, with the technical approval of the Russian Ministry of Construction. The snow fence must be positioned in the area of the potential detachment of snow, during a snowless period. The height of the fence must correspond to the maximum height of the expected snow blanket. Depending on the slope morphology, it may be necessary to install various rows of structures, on the upslope and downslope sides of a potential failure point. This limits the propagation of the shear failure and the resulting movement of the mass of snow. reduced maintenance: all components undergo a thorough check every 3 to 5 years. After these time-limits expire, there is no need to completely replace the system; it is enough to replace the damaged elements. Our snow fences were first installed in Russia to protect the South Ural railway in 2014. A 2.5 m high barrier was chosen for this project and proved to be a reliable avalanche prevention measure as snowdrifts ceased in this area. In 2017, Russian Railways ordered over 6,100 linear meters of snow barriers with foundations for mixed soil to be installed along the Novokuznetsk-Tashtagol section of the West Siberian Railway. Our engineers can design bespoke technical solutions for avalanche protection, taking into account slope angle, type of soil, thickness of the layer of snow, environmental conditions and exposure of the slope itself. They are also available for site visits and supervision during installation. Contact us if you need more information about our avalanche prevention systems.